As we have created some very useful custom Synths, the rhythmic patches are also very useful for the Hybrid/Cinematic genres of composition. We have also included many patches which can be used by the composer in a lot of other different styles making sure the sounds you can use fit into varies of styles instead of 2. We have also been kind enough to include 2 bonus categories of sounds like our Cinematic Rhythms called "Bonus FX" and "Hybrid Grooves" These FX and loops are sampled and processed to fit the Hybrid/Sound design genre which we mainly focused this library to influence the composers in the Film/Game industry. Timing of 1/4, 1/8, 1/16 and 1/4D, 1/8D and 1/16 D.
Option to turn it on/off by clicking Sequencer at the Audio view/Sequencer area. 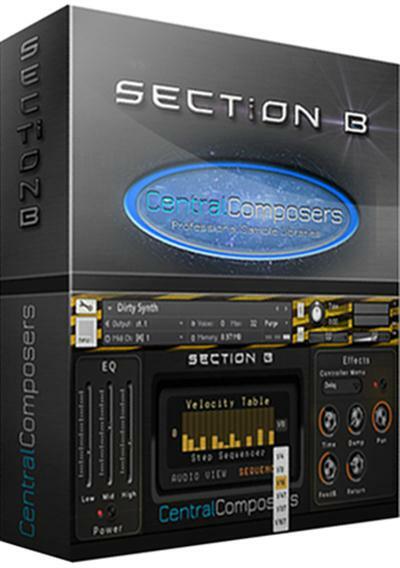 Section B was designed to be a huge improvement on Cinematic Rhythms with the quality of sounds and the amount of samples per instrument for less pitch shifting and more realism. As Section B is being developed more, we are thinking of a few more projects in mind to finish before the end of 2014 and hopefully we will have 2 more products done after this one.